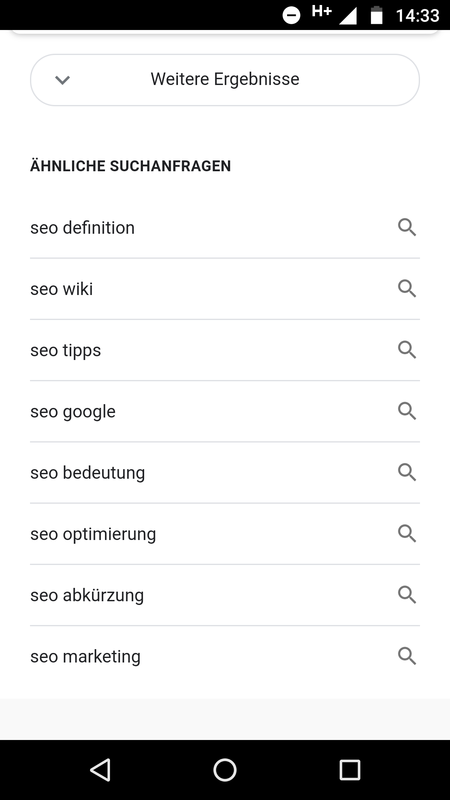 When you enter a search term on a mobile device in Google search, no more page numbers (pagination) appear at the bottom of the page, but “Further results” (see screenshot). If you click on this button, further results will appear. The advantage: the further results load faster now, since they are integrated into the existing page. For publishers, this creates new opportunities: even those who appear further back in the search results (classically speaking: from page 2 of the search results page and further) will probably now be able to hope more often for clicks from users. By the way, Google does not rule out that the button “More results” could also be introduced soon for the desktop search. This would mean nothing less than the end of page 2 for the SERPs. In a hangout, John Müller (Google’s “contact point” for webmasters on SEO issues) explained why even well-done pages with strong content can sometimes lose rankings. The reason for this is that Google not only considers the quality of web pages, but also their relevance for the respective search query. And this can change over time. Ranking losses do not always have to point out errors or poor quality of a page. In some cases, the search behavior of users simply changes. An example of this would be the release of a new iPhone model. This would automatically change the weighting and thus the relevance of pages on the topic of smartphones. As soon as the hype about the newest model diminishes, again more general sides can be in demand around the topic. Müller recommends, however, always to take a closer look at the page again in the event of ranking fluctuations. Are all contents still indexable? Are the outgoing links still correct? In addition, it is of course always useful to ask your own users for feedback to the site to find out what should be changed. If you use images of a stock photo provider for your site, you should not use the provider’s search from an SEO perspective. You will achieve better rankings if you select a photo that already ranks well with your keyword in Google’s image search. This way you’ll get the photo that matches your keyword best on Google. This strengthens your site for the keyword you are targeting. The reason for this is: Google stores a kind of meta-image for each image. If the word “cat” also appears in the old text, in the title of the image, in the description and in the textual environment of the image, Google will evaluate this meta-image as a search result for the keyword cat. Therefore, make sure that you always mark images as consistently as possible. If you would use the cat picture for example in an article about tigers, lions and other big cats, Google will irritate at least once. You could still use the picture, of course. However, it would be advisable to use at least one more picture, which ranks well with the term “big cat”. This way Google understands the intention of your article better and you have a better chance to rank with your article for the desired keyword. By the way, you when awarding images. Your keyword should even appear in the old text, the title, the description and the text around the image.